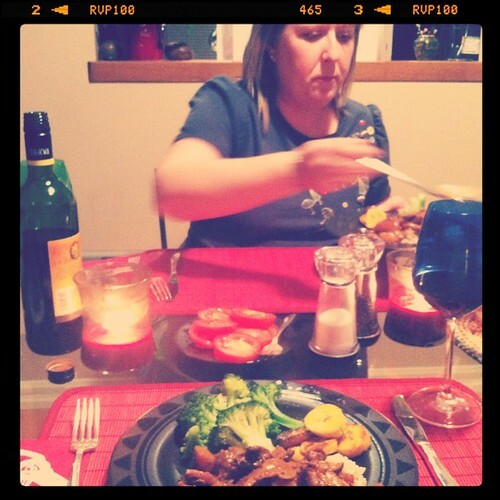 Only one night to eat dinner at my mom's place? Then, fricassee chicken it is. Fricassee chicken is my favourite Trinidadian meal. 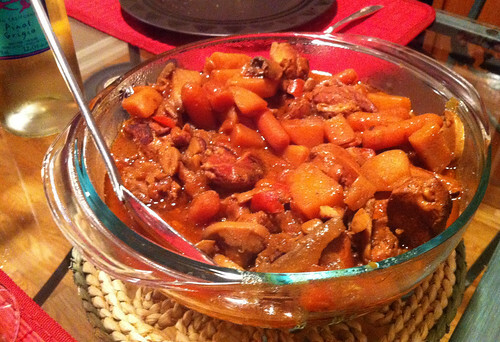 It's basically caramelized, stewed chicken with potatoes and carrots. We made it together last time I visited (a shocking two and a half years ago) -- here's the link to the recipe. 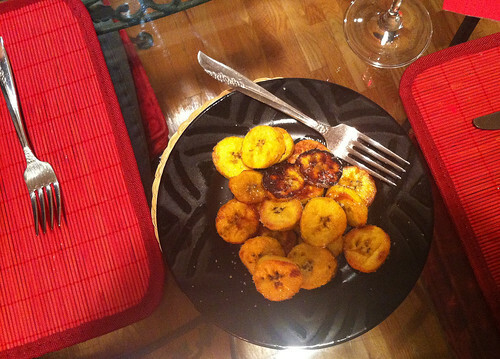 Plantain is a traditional Trini side dish, and it is perfect with fricassee chicken. It looks like a big, wild banana. Here are some plantain tips courtesy of my mom: When you buy plantain, buy it ripe: dark, with yellow and black patches (the blacker the better). It should be soft to the touch (don't buy the green and hard ones). To prepare: Sprinkle some white sugar onto a large plate. Peel and slice the plantain into chips -- about 1/4-inch thick. Heat up a frying pan and add butter. Once butter melts, add plantain chips. When they start to brown, turn them over. Keep turning until you have a nice sear on both sides. Remove from pan and place slices on sugar plate; turn over to make sure they are coated on both sides. Aaand, that's it! A TASTE OF TRINIDAD.